Build the hairy woodpecker birdhouse with cedar, pine, or almost any soft wood. Use wood rough-cut on both sides so that birds can grip both interior and exterior surfaces. Make a 6″ by 6″ floor (inside dimensions) and a 14″ floor to ceiling height (inside front). Drill a 1 5/8″ diameter entrance hole located 11″ above the floor (to top of hole). Cut or drill ventilation openings in the floor and under the roof. Mount 12 feet or higher on a tree in a forest, forest edge, or grove. See see the hairy woodpecker species page for habits and ranges. Because this nest box installation is at a significant height, it should be installed and maintained by professionals. Carpenters, electricians, line workers, etc. often have the right equipment and experience. Remove the nest and clean the box well after the brood rearing season is past. Store or leave the box installed during winter. Birds might use it for a warmer. 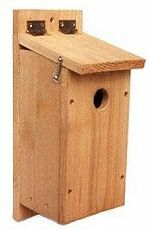 Other woodpeckers and birds may also use this nest box. Monitor this house. House sparrows and starlings like birdhouses with larger entrance holes. 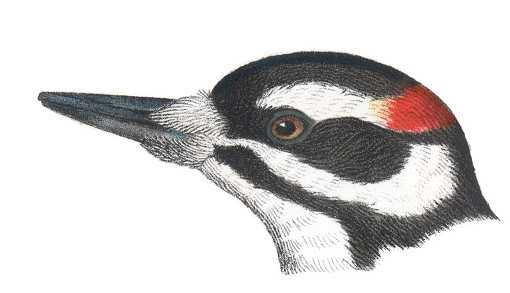 Build the Hairy Woodpecker with cedar, pine, or almost any soft wood. Use wood rough-cut on both sides so that birds can grip both interior and exterior surfaces.